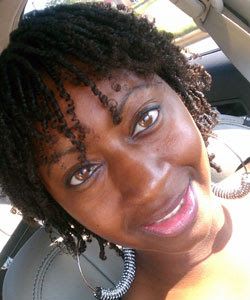 Finger coils are a great styling option for naturals of many lengths. In all the eight years I’ve been natural, I thought I could only rock coils at a shorter length, but that is so far from the truth! I had a chance to experience this for myself with the help of Houston stylist Candace Walls of Sovereign Styles Hair Studio. Using products from the Design Essentials Natural line, she took my hair from curls to coils in no time flat! I’m a pretty quick learner and I really think this is a style I can do at home myself. However, never having thought I could accomplish this type of style was really the only thing holding me back. Clip the rest out of the way. Within that row, section pieces less than an inch square, to create the individual coils. Apply a cocktail of products to each section, rubbing with your finger tips. Once the products are applied, stretch and twirl your hair until it forms the coils. Make sure the hair is coiled down to the scalp. This will ensure the coils stay longer and you won’t have to deal with the dreaded puffy roots madness! Repeat this technique all over your head. It shouldn't take longer than an hour and a half to complete. Sit under a dryer until your hair is completely dry, and voila…professional coils! The next step to coils is a coil out, which was accomplished the following day. Just as you would with a twist out, your coils can be separated until you achieve the desired effect. Because my hair is so tightly coiled, the resulting coil out wasn’t as voluminous as my twist outs are, but they looked great! I continued to separate them over the next few days and my hair never quite got to the frizzy state that comes with fourth and fifth day hair. Coils & coil outs can last quite a while with proper nighttime maintenance and even that is simple. I slept with a satin bonnet the entire time I had the coils and my hair was never out of place. My only caution with this style is to be careful upon undoing the coils. Because my coils were so small and tight, I had a hard time separating them all enough to make detangling less of a chore. I separated my hair into four sections and applied my favorite detangler Nourish by Earth’s Nectar but it didn’t do much to help get through the small coils. I found myself having to go just about coil by coil, separating as much as I could until I finally whipped out my Denman paddle brush to finish the job. That wasn’t fun, but I think if I had more time to separate first then detangling would have been much easier. Moral of this story: Never say never to hairstyles for your curls! With the right products and some patience, our natural hair can be transformed into just about anything if you’re willing to give it a try. I loved my experience with finger coils. The maintenance and upkeep was super simple and it gave me a totally different look than I’ve ever had before. It curbed my desires for shorter hair and it was quite versatile! This can be a great styling option for busy ladies on the go, new naturals and everyone in-between. Happy styling! Have you tried finger coils on longer hair? Shorter hair? What was your experience? I love coils and had them done a few months ago. I really want to try them myself, but I don't know if I have the patience. When I washed them out I ended up using a whole bottle of conditioner just to make it easier. I have tightly coiled 4c hair & used to finger coil with KCCC before I learned to WNG. I just do not have the patience anymore, my arms would get so fatigued, twisting for so long I would get tired (and sick feeling) from having my arms in the air so long! And there is no separating with KCCC. Are finger coils considered a protective style? When I first big chopped (9/11/11) finger coils were my staple style. I absolutely loved them! I wore the coils in my hair for about 3 - 4 mths straight. Now that my hair is longer 6 -7 inches verses 2 - 4 inches then I could not imagine doing them now. It was very time consuming, usually taking me 2 to 3 hrs in one sitting to do my hair and I would do them like every 3 days because I liked for them to look fresh. It was a great style then and sometimes I think about cutting my hair shorter just so I can wear the coils again but achieving maximum length is the name of the game for me now. I not sure they'd be considered a true "protective" style because your hair is still out, but they are a great low maintenance style! I couldn't imagine doing them every few days...that would drive me nuts!! I never thought I could wear them with my hair being past my bra strap either though! You know I haven't done this since in over a year. I might need to try my hand at it again. Of course I would need to make sure I had plenty of time for twisting. My hair is a lot longer than it was 1 year ago. Love the coils and your cut! Wish I had the time and talent to do coils but already know it wouldn't be worth it because I'd wash it out in a few days anyway. I want to try this! I have long natural hair and sometimes I just get bored with doing twist out a lot. I would like to learn how to do this at home so I can learn how to do my own hair. Is it hard to coil? because I tried to do some on my wash n go it was a disaster.